Bostock is something I’ve been meaning to make for some time now, another delicious discovery thanks to Pinterest. I found it once looking for a brioche recipe and immediately knew I had to have it. Of course I first had to practice making brioche since I don’t have any good bakeries nearby. We have a vendor at our farmer’s market that makes fantastic brioche, but it is the rolls. I wanted to use a loaf, even though rolls would still work. Plus there is something special about making your own bread, but only of course if you enjoy it. If you don’t enjoy it then obviously it would be torture so go and buy yourself some good bread! Once I tackled making homemade brioche I knew I was ready for Bostock. Like I said before, you don’t need to use homemade brioche. You can certainly use bakery bought bread as well. Brioche has a rich and tender crumb thanks to the butter and eggs in it so if you can’t find brioche a challah bread would probably work well too. Now back to the Bostock, it was apparently created by French bakers as a way to sell day old brioche. 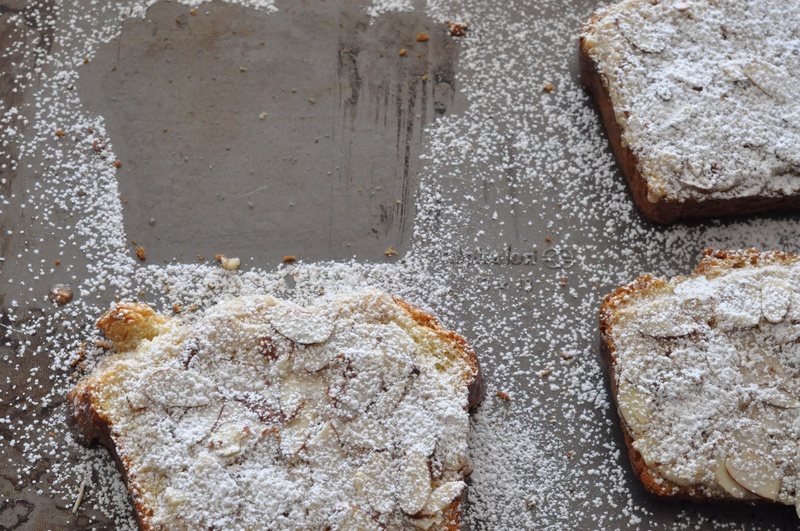 To make Bostock you simply take stale brioche, slice it and brush orange syrup on it. Then add some almond cream and sliced almonds and bake. It’s that simple, and yet the result is sublime. You bite into and it just melts in your mouth. The orange and almond flavor combination is perfect. It is sweet, but not super sweet. This would take your weekend breakfast to the next level or wow your guests at a brunch party. The boys will certainly vouch for it being a fantastic after school snack! As with most recipes there are many ways to make it. 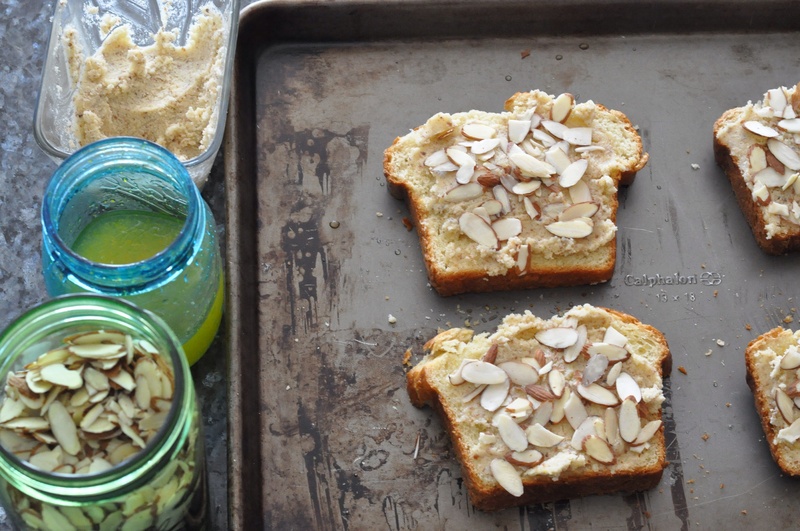 In researching Bostock I saw recipes where people toasted the brioche first and then added the syrup and almond cream. Some recipes used almond paste in the filling. This recipe is my take on Bostock, I tried to keep it simple with ingredients I already had in the house. Switch it up however you want. I am already thinking of my next batch and switching things up using homemade raspberry jam instead of the orange syrup and hazelnuts instead of the almonds…. To make the syrup combine the sugar, water, orange juice and zest in a small saucepan. Heat over medium high heat until the sugar dissolves. Remove from the heat and stir in the liqueur and vanilla. To make the almond cream place the butter and sugar in a small bowl and cream together. Add the almond meal and flour, stir until combined. Add the egg, rum and almond extract and stir until well combined. You can use this immediately, but it will spread better if you chill it for at least half an hour. Preheat oven to 350 degrees. Place the brioche slices on a large sheet pan and brush liberally with the orange syrup. Spread a thick layer of almond cream on top, leaving a small border at the edges so it doesn’t melt off the sides. Cover with sliced almonds and bake for about 15 minutes, they are done when the almond cream is slightly puffy. Allow to cool and dust with powdered sugar if desired. Leftover syrup will keep in the fridge (great for cocktails too)! If you have any leftover almond cream it will keep in the fridge for a few days until you get your hands on another loaf of brioche to make more! Yields: Approximately 10 servings, depending on the size of your brioche. 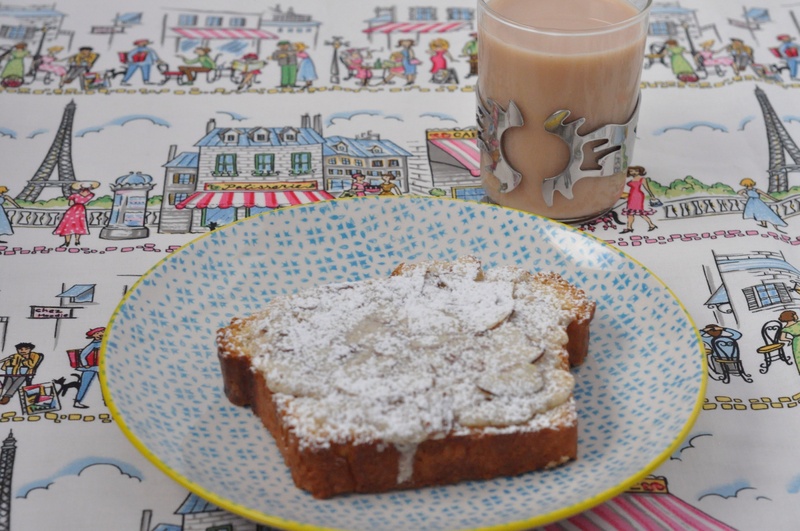 This entry was posted in Breakfast, Snacks and tagged almond orange toast, brioche, Brioche Aux Amandes, brunch, French on February 2, 2015 by Gretchen. Wow, what a delicious find – I’ve never tried this, but I do believe I need to! 🙂 Thanks for the share! Pinterest is dangerous, it opens up a whole new world of foods around the globe I must try! You are sooo right, I adore Pinterest! Oh it was very yummy! Sometimes it is dangerous knowing I can make such special treats, my waistline may never forgive me! mmmm…. Once worked at a grocery store where they had a case full of goods from a local bakery. That’s where I learned about Kouign Amann and bostock. Never even dreamed it’d be easy enough to DIY for the bostock. As for your next variations, rumchada for rum, yes? Oh what a fun store. One of the first things I noticed after moving to South Carolina is the lack of good bakeries, that and no good breakfast restaurants. There isn’t the European bakery influence here you get in the Midwest and I miss it. At least I know how to make some of the goodies now! As for the next variation, yes I was thinking of using RumChata instead of the dark rum and thinning raspberry jam with Frangelico. I’m getting hungry just thinking about it. Just last night the boys were talking about wanting brioche all the time, I’ve created monsters!! 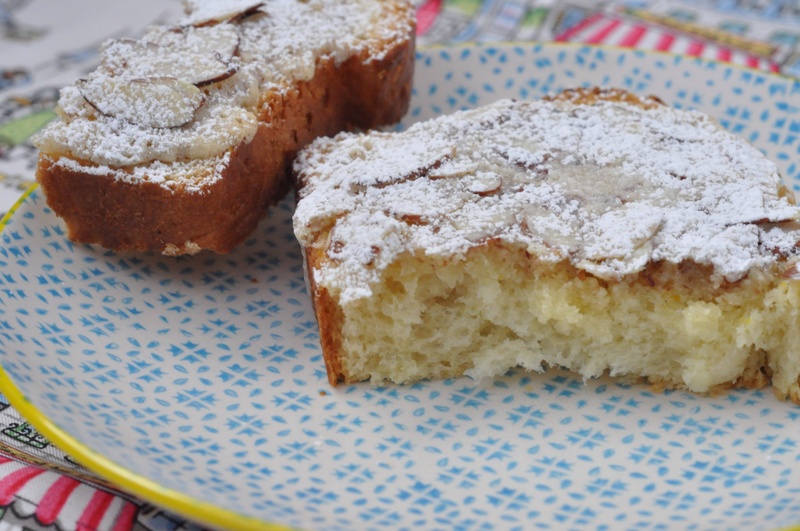 After that loaf I made for the Bostock I had a little dough left and made three brioche rolls on Saturday with mini chocolate chips for a morning snack outside and they loved it of course so now they want brioche rolls for their snack before swim this week…. This has scrumptious written all over it!!!!! what an amazing use for brioche, I had never heard of it…. It was new to me too when I found it on Pinterest! I also have the Bread in 5 a Day cookbook and they have a version making Bostock in a pan, similar to cinnamon rolls.